If there is a spare paper lying around here, it is a list of some kind. If there is a need to accomplish anything, my mind automatically grabs a pen and needs to make a list. Yes I am fantastic at making lists, HOWEVER I am not that great at ever looking at them again. My top kitchen drawer is a sea of forgotten lists. Why do I do this? Why do I feel the need to pre-chronicle my life with a series of disappearing lists? 3. Deep down I feel that the sheer act of writing the list will cause the information to somehow enter into this vault I call a brain. 4. Or it is the hope that the list will be a voice behind me, pushing me to achieve, to accomplish, to reach greatness, excellence. Whatever it is I admit I am a chronic list maker. I have come to the realization though that the reason I never look back at the list is that the list fails to motivate me. It does not provide me with the drive I need to accomplish. As important as the list is, IT is not the motivator. The drive I have come from me and me alone. I am driven towards excellence, and excellence is not determined by what you do (the list) so much as HOW YOU DO IT. That is why I do not feed off the list. That is why I love my job. I can make others smile by the excellent way in which I do my job. That is satisfaction. That motivates me, not the endless sea of forgotten lists I can’t seem to throw out. The other day I read an interesting statistic. It said that if you accomplish the fist 2 things on your list you are 80% more likely to complete the list. GOLD! This valuable piece of information has the potential to revolutionize my life! By strategic list making I can accomplish way more than ever imagined. Wrong! Why? …Where is the list? Didn’t I have a list for that? Don’t throw out that paper! Maybe I should have a file for lists, can one list footnote another? It is too much. 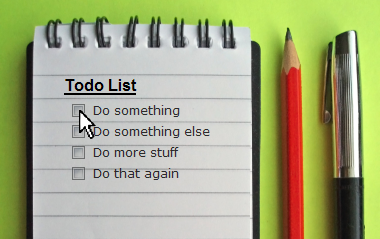 I even thought: Maybe if I spent less time making lists I could actually get things done. Gasp! Then I figured it out. It’s this little thing called a notebook. Only once I banished the post it note and only started writing my lists in my book did I realize the FULL power of the “List.” Try it. You will be amazed at your new found freedom and focus. Just make sure your notebook is big enough to not get lost. And make sure you only use ONE at a time, otherwise you’ll have a drawer full of little notebooks. That’s all the wisdom I have for you today. Now go get a book and start to pre-chronicle something awesome in your life!